Set in post-war Paris, the city is teaming with scheming CIA agents, Russian spies, ancient and ageless witches, along with the usual writers and courtesans. A murder brings an earnest police inspector into the mix and he is intent on unraveling the mystery, even after he has been changed into a flea. Set in post-war Paris, the city is teeming with scheming CIA agents, Russian spies, ancient and ageless witches, along with the usual writers and courteans. A murder brings an earnest police inspector into the mix and he is intent on unraveling the mystery, even after he has been changed into a flea. Inspector Vidot, on the other hand, is a hardworking police detective who cherishes a quiet evening at home. Until he follows a lead on a particularly gruesome murder—and finds himself turned into a flea. And the adventure wouldn't be complete without Oliver, a fun-loving American patrician who has come to Paris to launch a literary journal with the support of certain secretive friends. 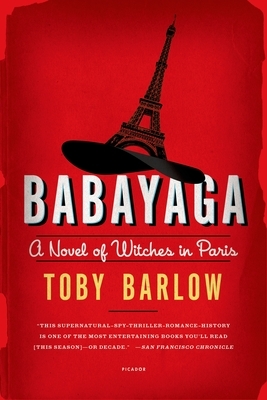 Add a few chance encounters, a chorus of angry witches, and a weaponized LSD program, and you have Toby Barlow's Babayaga: a wickedly sharp tale of the City of Light that's part love story, part thriller, and pure brilliance.